And it's time for Sony Ericsson to start rolling out their handsets again. This week we not only got one but four new phones. First up is the Sony Ericsson W960i. The Sony Ericsson W960i has been announced last June and Sony has just started shipping these babies. I thought the Sony Ericsson W960i was set to be an iPhone killer but we all know that there's no such thing as an iPhone killer. Oh well, there's really no harm in trying, Sony Ericsson. The W960i's design is far from the iPhone though it does sport a large 2.6 inch touch screen interface. So if it's not an iPhone killer, we may as well dub it as a Nokia N81 8GB killer. The Sony Ericsson W960i also sports a an 8GB internal memory and a 3.2 mega pixel camera. 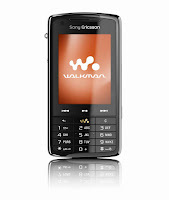 For the Sony Ericsson W960i's specification, visit Sony Ericsson's website.